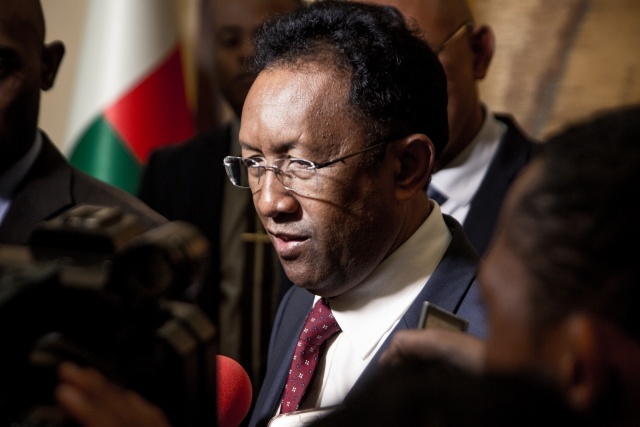 (AFP) - Madagascan President Hery Rajaonarimampianina stepped down Friday, in line with the constitution, to contest elections in which he will face rivals including opposition leader and ex-president Andry Rajoelina. Rajaonarimampianina resigned two months ahead of the November 7 vote on the Indian Ocean island that has been beset by political instability. "The time has come for me to resign in accordance with the constitution and today I have submitted my request to the constitutional court," he said in a brief televised speech. Mounting protests earlier this year forced Rajaonarimampianina to accept the formation of a "consensus" government tasked with organising the election. Demonstrators took to the capital Antananarivo's central square between April and June over Rajaonarimampianina's efforts to change electoral laws that opponents said were intended to favour his party. Also on the ballot paper will be opposition leader Marc Ravalomanana, Rajoelina's predecessor as civilian head of state. Rajoelina removed Ravalomanana from power in a coup in 2009. If no candidate receives more than 50 percent in the first round, a second round of voting will be held on December 19. The country's interim leader will be senate Speaker Riko Rakotovao.